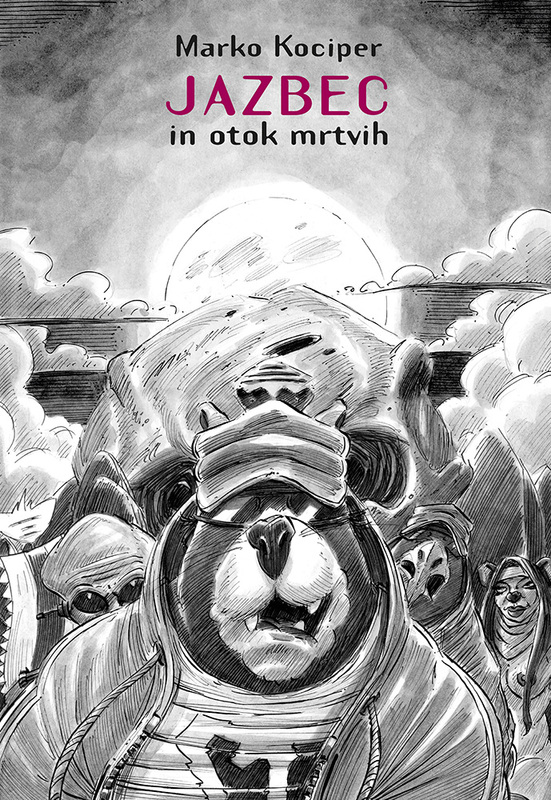 Badger and the Island of the Dead – 2nd part of Kociper’s comics trilogy! Badger’s incredible adventures never end! ‘Badger and the island of the dead’ is the second part of the Badger’s trilogy. Our main hero, disappointed with his failure to obtain the wondrous alien technology, retreats in hiding in one of his lairs, presumably, where he is most certainly preparing his revenge and a big comeback. The second part thus serves us with the continuation of the first story, following Badger and his best buddy Eagle on their epic adventure on the island of the dead. But not everything goes according to plan: the aliens show up again! Exotic locations and picturesque backdrops, pretty girls and manly men (and animals, too), unbelievable plots and sudden twists & turns, spiced-up with a hint of mythology, philosophy and much more — all this you can find in the second installation of Badger’s incredible adventures. The first Slovenian vulgarly incorrect saga continues, Badger’s groupies are swooning, while fans demand special premiere previews of the story and artwork, speculating if the second part will finally attract the attention of Hollywood studios. »Badger loves ya all!«. Reading of the comic is not advised to people sensitive to straightforwardness and minors under 16. Events shown were executed by trained professionals. Do not try this at home. All the events are allegedly fictional, any similarity to real event and people is purely coincidental. Marko Kociper is very well known to Slovenian comics readers for his comics that are always full of unusual stories and picturesque characters, bizarre and provocative just enough to be humorous and socially critical. He finds inspiration for them in everyday life and common people who, in the end, turn out to be quite uncommon. Kociper’s comics have been published with Polet, Delo, Dnevnik, Mladina and elsewhere, while his comics albums are regularly published with us. He usually writes the scenarios himself, but sometimes he adapts existing literary texts (prose by Vinko Möderndorfer, poetry by Andrej Rozman-Roza and short stories by Miha Mazzini). This time he’s chosen to continue the Badger’s saga, inspired by the Native American folktales and modernized in the Kociper’s characteristic style and manner.